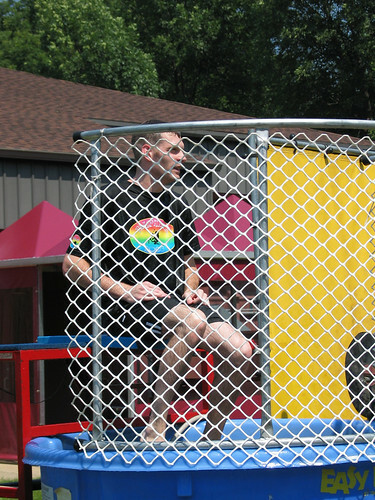 Yesterday I had the opportunity to be in a dunk tank for the first time. My company, Press Ganey Associates, is one of the Pacesetter companies for the United Way. The dunk tank was one of the ways to raise money for this cause. I was in the dunk tank for about 20 minutes. Kelly brought the girls to take part in this experience. Megan was the first to dunk me. She threw right at the target and hit it, except the tennis ball didn't carry enough weight to drop the target. A friendly helper pushed the target after she had hit it. Kelly took a couple of turns throwing and dunked me twice. Thanks Sweetheart! I took my share of dunkings from fellow employees also. I am sure that this is just an oversite, Sweetheart, but I dunked you THREE times. I did have a good time doing it too.